RALEIGH – The N.C. Department of Commerce has launched a new job-search website helping talented job seekers and employers connect with each other. The new system, NC Works Online, provides a one-stop platform to streamline the job search process, while improving security and reducing annual operational costs by more than $2 million. NCWorks Online is a no-fee service that provides several benefits to job seekers and employers. Job seekers can search through job posts pulled from thousands of websites and receive alerts through e-mail and text message. Employers can post jobs to find the talent they need, as well as take advantage of real-time labor market information that will assist them in making competitive offers to recruit high-talented workers. NCWorks Online was developed by the Florida-based Geographic Solutions, which has developed similar job-search systems for 18 other states. It replaces NC JobConnector, which had served as the division’s online job-search tool. NCWorks Online will also eliminate the need for eight additional information systems, which is expected to save $10.2 million over the next five years. To access NCWorks Online, visit www.ncworks.gov. To learn more about the N.C. Division of Workforce Solutions and the services it offers through its local workforce offices, visit www.nccommerce.com/workforce. Coming Together – Partners in Service Excellence! 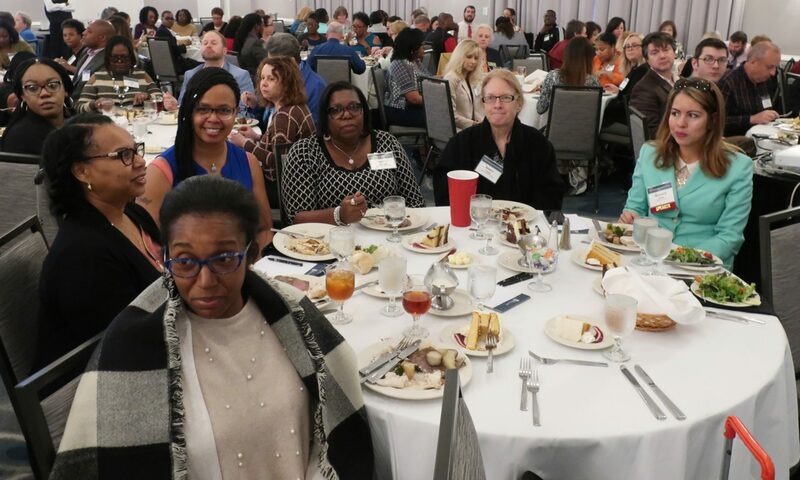 The North Carolina Workforce Development Partnership Conference attracts approximately 1,000 Workforce Development Professionals from across the state. Attendees represent labor, state and federal government, education, community-based organizations, community colleges and the private sector. In its 26th year, the Conference continues to offer timely topics and networking opportunities. NCETA 2013, a set by rjwitch on Flickr. In this changing world, our future depends on building a society where people are given the opportunity and encouragement to develop their skills and abilities to the maximum; and then given the support to rise as far as their talents will take them. This is true for the individuals and employers we serve as well as all workforce professionals. NCETA strives to provide workforce professionals with education and training to enhance and grow the work we do. Our annual conference targets the front-line staff person working with jobseekers and employers in local communities across the state. NCETA is working to provide opportunities for workforce professionals by sponsoring regional training, coordinating with the annual Partnership Conference, our NCETA newsletter, and the NCETA annual conference to name a few. Join us at NCETA as we all work toward a more educated and skilled workforce that will successfully face the challenges that lie ahead. The 2012 NCETA brochure is ready to be downloaded, click below to get the latest brochure. The NC Commission on Workforce Development has released a video and report highlighting ARRA-funded workforce development programs and the citizens who, during the recession, received training and career development assistance and now have an enhanced quality of life exemplified in newfound employment. Brendon Davis came to Johnston County Industries’ Yes I Can Program about two years ago after being frustrated with the path that he was on. Making some poor choices that many youth do, Brendon was ready for a change in his life. Having a child of his own now, he wanted to set a better example for his daughter. By doing so, he inquired about the Yes I Can Program, which is funded through the Workforce Investment Act by Capital Area Workforce Development Board. Brendon began taking GED classes at JCI and the staff of the Yes I Can program assisted him in setting goals and supported him with those goals. With the encouragement and resources of the Yes I Can program, along with Brendon’s drive and determination he complete the requirements to earn his GED and put himself in a position for gainful employment. After obtaining his GED, JCI’s Yes I Can program provided Brendon with a work experience at the Selma Housing Authority. This was Brendon’s chance to prove himself with real world on-the-job experience. Brendon excelled on the job and the Selma Housing Authority staff were impressed, so much, that after the work experience was completed, they hired him on full-time. This via WTSB Radio :: 1090 AM :: Station History. NCETA shares news for all it’s members.